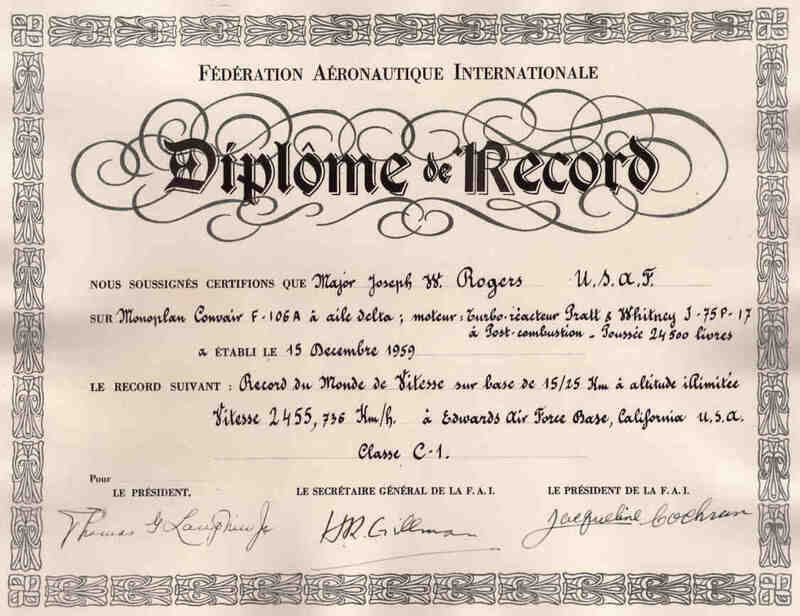 At an altitude of 40,000 feet (12,192 meters), Rogers made two passes over the straight 11 mile (17.7 kilometers) course, once in each direction, for an average speed of 2,455.736 kilometers per hour (1,525.924 miles per hour)—Mach 2.31. For his accomplishment, he was awarded the Distinguished Flying Cross, the FAI’s Henry De La Vaulx Medal, and the Thompson Trophy. Joseph William Rogers was born at Chillicothe, Ohio, 28 May 1924. He grew up on a farm, and attended West High School, graduating in 1942. He enlisted in the U.S. Army Air Corps in 1943 and trained as a pilot. From 1944 he was assigned as a flight instructor in California. Rogers remained in the Air Force after World War II. 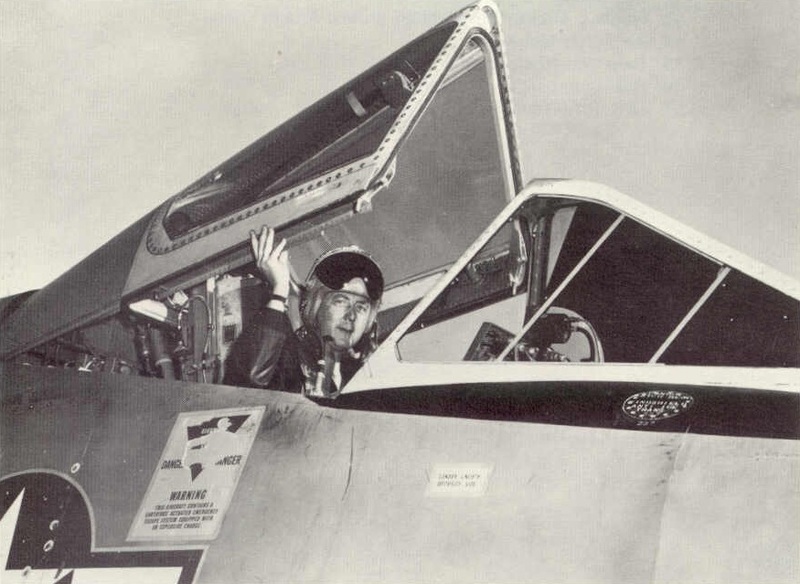 During the Korean War, Joe Rogers got the nickname “Whistlin’ Joe” when he put whistles on the wings of his North American Aviation F-51D Mustang in an effort to frighten enemy troops. 1st Lieutenant Rogers was awarded the Silver Star for his actions of 8 October 1950, in close support of a British infantry unit, which was surrounded on a hilltop by the enemy. Though not officially credited, it is widely accepted that on 8 November 1950, with his Mustang Buckeye Blitz VI, he shot down an enemy Mikoyan-Gurevich MiG-15 jet fighter. An aerial victory of a piston-engine fighter over a jet fighter was a very rare occurrence. Rogers was one of a group of “The American Fighting Man” named Man of the Year by TIME Magazine. 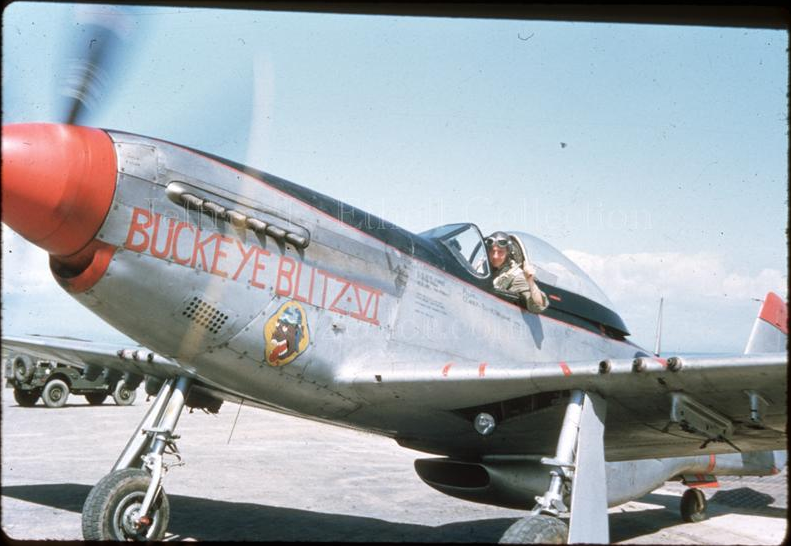 He flew 170 combat missions in the F-51 and another 30 in the Lockheed F-80 Shooting Star. 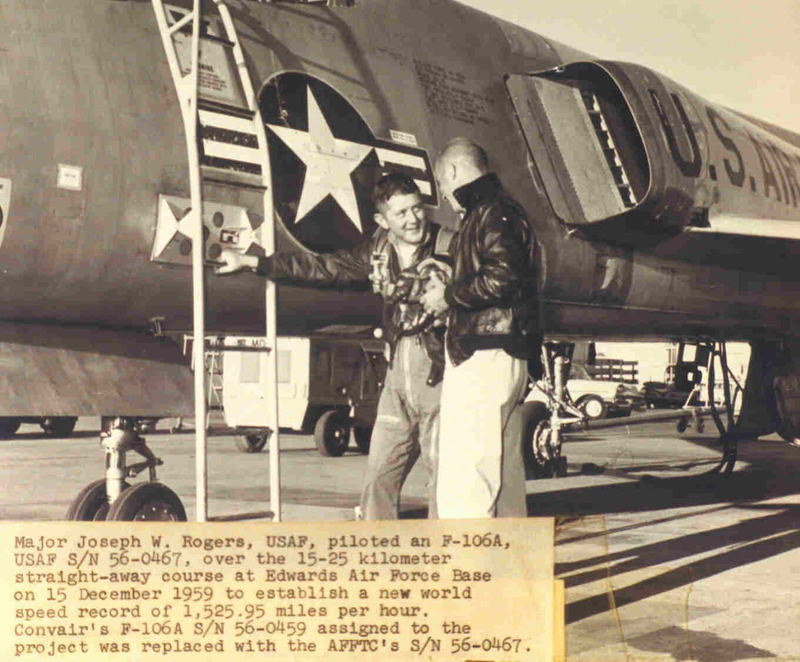 Rogers was a 1954 graduate of the Air Force Test Pilot School and worked as a test pilot on the North American Aviation F-86D Sabre radar-equipped interceptor, and then the Convair F-102 Delta Dagger and F-106 Delta Dart. 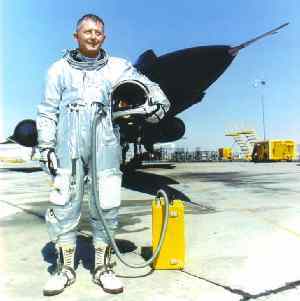 Next, Rogers he commanded the Lockheed SR-71A and F-12A Test Force at Edwards Air Force Base. He is one of the few pilots to have ejected from an SR-71A, when 61-7953 went out of control, 18 December 1969. Both he and Radar Intercept Officer Lieutenant Colonel Gary Heidelbaugh safely escaped the doomed Blackbird. Colonel Rogers was Vice Commander of the 3d Fighter Wing, flying the McDonnell F-4 Phantom II during the Vietnam War. After serving as Assistant Deputy Commander of the 7th and 13th Air Forces, he was appointed Chief of Staff for Operations at the Aerospace Defense Command Headquarters, Peterson Air Force Base, Colorado. Rogers retired from the Air Force in 1975 after 32 years of service. 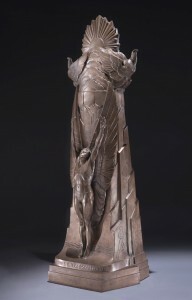 Joe Rogers worked for Northrop Aerospace for the next 13 years, marketing the company’s F-5 and F-20 fighters. During his service in World War II, the Korean War and the Vietnam War, Colonel Rogers was awarded the Silver Star, the Legion of Merit with two Oak Leaf Clusters, Distinguished Flying Cross with two Oak Leaf Clusters, and Air Medal with thirteen Oak Leaf Clusters. Joe Rogers was married to the former Charis Tate. They had three children. Mrs. Rogers passed away in 2003. Colonel Joseph W. Rogers died at Healdsburg, California, 6 August 2005, at the age of 81 years. He is buried at Arlington National Cemetery, alongside his wife. 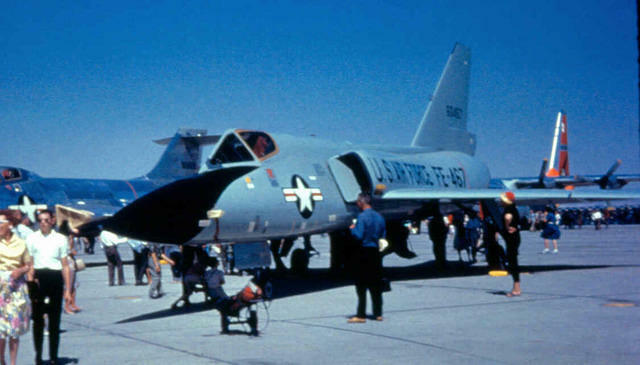 The Convair F-106A Delta Dart was the primary all-weather interceptor of the United States Air Force from 1959 to 1988, when it was withdrawn from service with the Air National Guard. 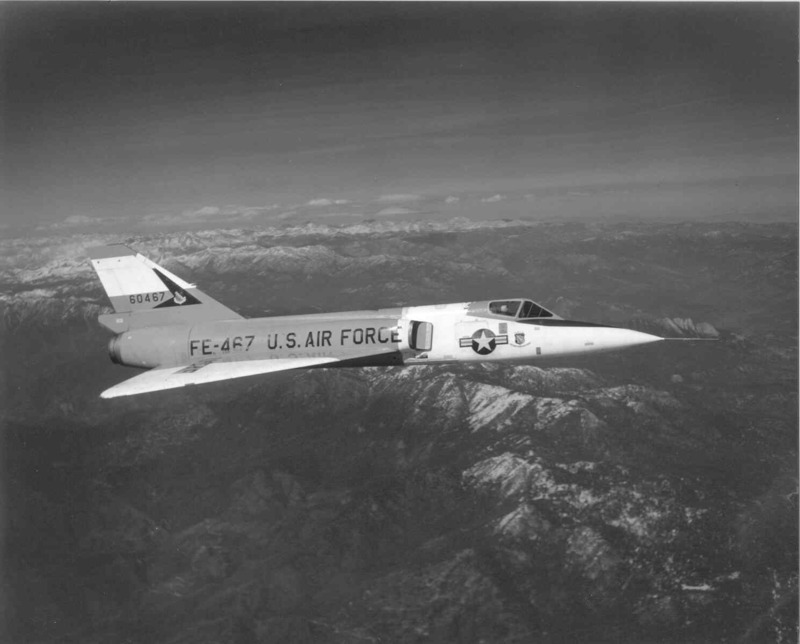 It was a single-seat, single engine delta-winged aircraft capable of speeds above Mach 2. 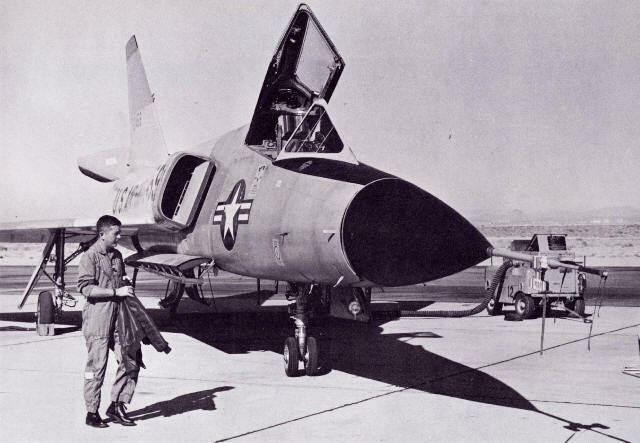 The airplane was a development of the earlier F-102A Delta Dagger, and was initially designated F-102B. However, so many changes were made that it is considered to be a new aircraft. The F-106A is 70 feet, 8¾ inches (21.558 meters) long with a wingspan of 38 feet, 4 inches (11.684 meters). The total area of the delta wing is 697.83 square feet (64.83 square meters). The angle of incidence was 0° and there was no dihedral. The leading edges were swept aft 60°. The top of the vertical fin was 20 feet, 3¼ inches (6.179 meters) high. The Delta Dart weighs 23,646 pounds (10,726 kilograms) empty, and has a maximum takeoff weight (MTOW) of 38,729 pounds (17,567 kilograms). 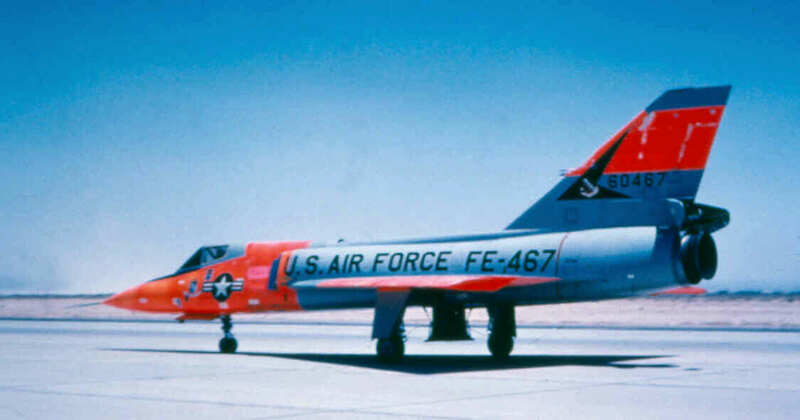 F-106A 56-0467 was built in April 1958 and was the eighteenth production aircraft. 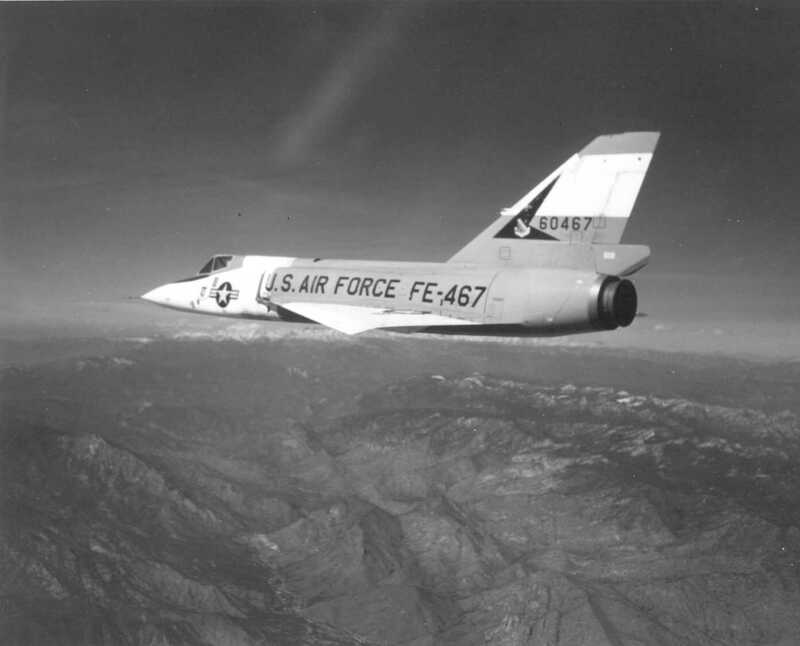 After being used for flight testing at Edwards Air Force Base it was converted back to an operational interceptor and assigned to the 329th Tactical Fighter Squadron at nearby George Air Force Base. On 14 August 1961, while taking off from George Air Force Base, Victorville, California, on a routine training mission, 56-0467’s right tire blew out. 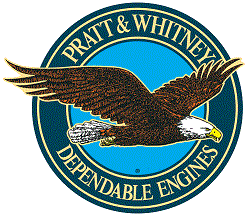 The pilot, James Wilkinson, flew until most of the airplane’s fuel had been exhausted, and then landed at Edwards Air Force Base because of its longer runway and available emergency equipment. After touching down, the right wheel and brake assembly caught fire. The flames quickly spread to the wing and fuselage. The aircraft slid to a stop and the pilot safely escaped. 467 was totally destroyed. 56-0459, which had been scheduled to make the speed record flights, is on display at the McChord Air Force Base Museum. U.S. Air Force public relations photograph.